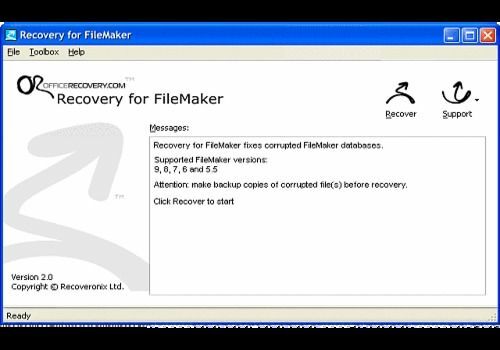 Recovery for Fikemaker is a powerful data recovery software for damaged FileMaker Pro database files (.FP5, .FP7). Recovers tables and table data. Stores recovered information into common .DBF format, compatible with many database applications. Supports FileMaker Pro 10, 9, 8, 7, 6 and 5.5 databases. Easy to use, no special user skills required.